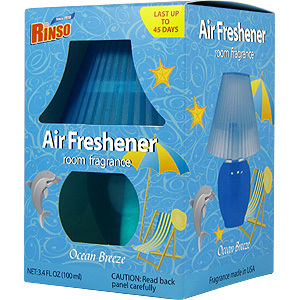 Rinso room fragrance fights against unpleasant odors, while brings natural fragrance air around you. Give your room clean, fresh air form grassland. 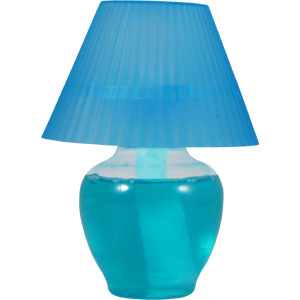 Replace plastic lamp top securely. CAUTION: Avoid contact with eyes, hands or skin. Avoid contamination of food. Do not intentionally inhale vapor or spray mist. Use only as directed. Misue by deliberately concentrating or inhaling the contents can be harmful or fatal. Always wash hands after use. FIRST AID: In case of eye contact, wash thoroughly with clean water for 15 minutes and contact a physician. If sprayed into mouth, rinse mouth with clean water thoroughly, seek medical attention. KEEP OUT OF REACH OF CHILDREN! DO NOT EAT! 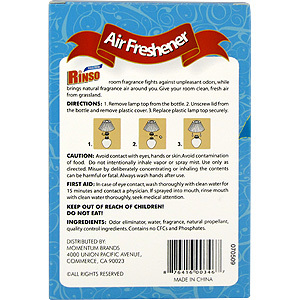 Odor eliminator, water, fragrance, natural propellant, quality contron ingredients. Contains no CFCs and Phosphates. 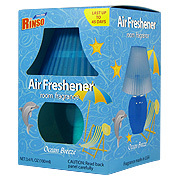 Air Freshener Ocean Breeze is shipped in a discrete, unmarked package. Orders are processed immediately and usually take about 3 to 5 working days to be received. We do ask that you try it for 2 to 3 weeks to feel the full effects. Any information received is used only for order processing and shipping purposes. Your information, such as e-mail address, will never be disclosed to a third party.